Saturday was old home day in the graveyard. All of us who have been to a funeral or graveside service understand that those occasions are, to some degree, social in nature. The mood is usually pretty somber. However, that’s not the case on the Friday and Saturday before Easter Sunday if you’re in a God’s Acre graveyard somewhere. I was blessed to grow up in two Protestant denominations: Moravian and Methodist. While I am most active in the Methodist church, I still cherish my associations with the Moravian Church. To put it plainly, Moravians have some cool traditions that other denominations don’t. Preparing your family’s gravesites for the Easter Resurrection Service is one of them. It starts with the graveyard itself. God’s Acre is the name used by Moravians for the graveyard associated with their congregation. It’s reflective of our German heritage and means “Field of God”. Moravians believe strongly in equality, including at death. Consequently, all headstones are the same shape, size and color (white) and are flat on the ground. It creates a truly beautiful setting. If you’ve seen a military graveyard where all the markers are white crosses, you will have a better idea of the impression you get. I’ve always referred to God’s Acre as the “most un-scary” graveyard around. This picture is from God’s Acre in Old Salem, Winston-Salem, NC. It covers the area down to the white car, across the green area and up the hill and to the right. The first stone was laid in the 1790’s. Members of the congregation who are buried here are buried in what are referred to as choirs. This is a mirror of how they sat in church (in the early days) as well as their station in life: married men, married women, single men, single women, and children. 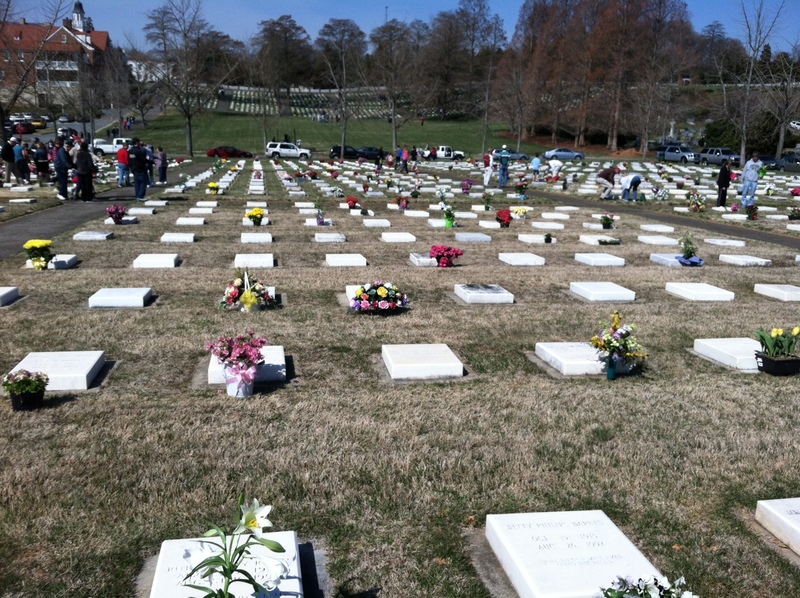 The graves are laid out in a grid pattern and are in chronological order. If you are looking for a gravesite, a date of death can get you a long way. There are paved walkways between the grids and green water pumps scattered throughout. We have so many relatives in the God’s Acre here that we’ve been using a map for years. My cousin’s husband Tod is great about updating it as needed; I got my new copy on Saturday. All extended family members are invited to meet in the parking lot at 10:30 a.m. Everyone knows to bring buckets, scrub brushes, cleanser, gloves, flowers and stakes. Then we divide and conquer. Family members who do not come are the recipients of disparaging remarks for the rest of the year. Redemption comes when you show up to clean the next year. We usually end up going by all the relatives’ graves so we can say “Hi” to the loved ones we knew and wonder aloud about the ones we didn’t. Along the way, we’re checking out the inscriptions and giving our opinions about the flowers and cleaning job done by others. We run into old family friends, chat with strangers and rehash family memories. This year, we spent some time in what we’ve dubbed the “condo” section. This is a relatively new section for cremated remains. Same type of headstone, just smaller. Still beautiful. On Saturday we had 3 generations present: my 2 paternal aunts, now the family matriarchs; 11 of my generation, my siblings, some cousins and some outlaws – those who marry into our family; and 9 of the younger generation. This group included 2 soon-to-be family members – Jen will marry my nephew Alex this summer and Lewis will marry my niece Emily this winter. If you want to get in good with the family, come clean gravestones before the wedding! Once all the cleaning and visiting is done, our crowd piles up in our cars and we head for a local restaurant for lunch together. Some families stay and tailgate. Why not? There’s plenty of room for the little ones to run and play…plenty of people milling around for the afternoon. Just bring the lawn chairs and your food. 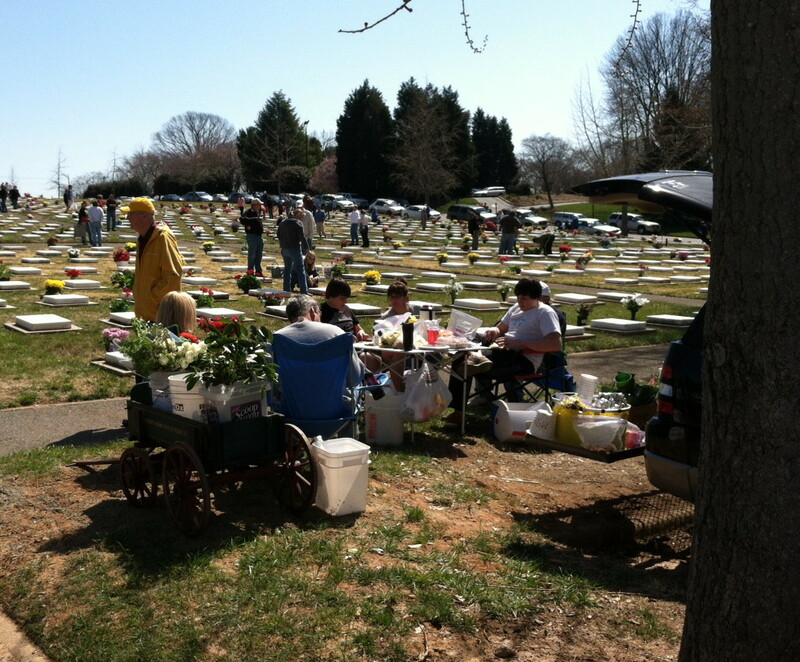 If the weather’s as beautiful as it was this past Saturday, it’ll be a wonderful old home day in the graveyard. Then come back Sunday morning for the Resurrection Service. Watching the sun rise over the expanse of white stones, highighted by colorful flowers, is more than worth the effort.